* English will be followed. 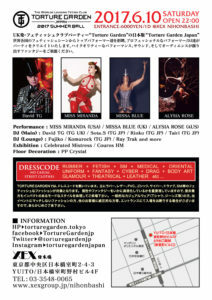 Enforced Fantasy Dress Code (Full Costumes Only / No Half Measures / TG is an Extreme Event for Extreme People! ): Fetish, Body Art, SM, Burlesque, Berlin Kabaret, Drag, Medical, Militaria, Uniform, Venice Carnival, Circus Carnival, Top Hat & Tails, Kimono, Ultra formal,rubber, viniel,PVC,leather, etc.. Copyright ©2019 クラブナビ.com all rights reserved.